My husband’s side of the family is Danish and we are fortunate enough to still have family in the U.S. Virgin Islands, (once a former Danish colony), to go and visit on occasion. We were there over Thanksgiving, and always enjoy taking part in the jump-ups, which is like a large-Carnival type parade that inevitably includes the moko jumbies. A moko jumbie is a stilt walker, or dancer. 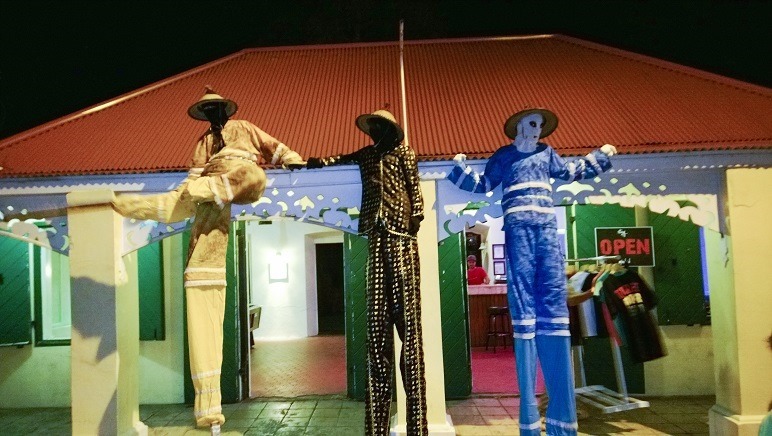 Moko jumbies are thought to have emerged from West African tradition. I have heard some of the island old timers say the Moko jumbies walk on their high stilts as guardians and protectors. Due to their amazing height, they can see the evil spirits and chase them away. They foresee evil and danger and become good luck. Their costumes typically evoke a feeling of Carnival, with masked faces. If you opened up your closet door and a Moko Jumbie was in there, (and you didn’t know they were actually good luck), I think you might be scared at first to see one. Taking stock of ourselves as parents who yelled or taking stock of households that have a lot of yelling is a bit like finding a Moko Jumbie in the closet. It seems scary to look and actually see what is beneath the yelling. Yet, the things that are there can also be the key guardian and protector of future communication and interaction with our family members. Do we really want to continue to live the way we have been? The experiences we bear within ourselves as parents, good and bad, become the parade of parenting life. Perhaps it is now time to move to lead the parade in a way that is safe and preserves the dignity for all participants. Perhaps now is the time to have a parade route that leads to fun and joy. If you really want to change – if you really want this – then I invite you to be open enough to see what lies beneath the yelling, and to use those experiences, feelings, and strivings to be who you want to be as a human being. You are enough in who you are now, and you have all that you need to be what you want to be in parenting. Your homework, in the spirit of being open, is to think of your not so stellar times as a parent, and then to think of the times you WERE marvelous. Because those times are there as well. Those times are the times you need to capture and what you will build upon in the future as you explore a path that uses all of you to create positive change and positive discipline in your homes. I look forward to the 31 days. I will admit that I have become a yeller/threatener/ in my home and that was never something I wanted to continue from my own upbringing. I had never thought of it as a SYMPTOM before reading your previous post-I am willing to be open to figure out what is underneath and to heal both myself and my relationship with my young children this year, become the protector instead of the boogie mama. I love that image of the protector and the guardian! Thank you, Carrie – I love your metaphor of the Moko Jumbie. Looking forward to following along and being open. It is the perfect time for our family – summer holidays in Australia – so we are enjoying a slower pace and more time together. Thank you for creating this series. Hi Carrie, Yes, I took our conversation to sleep with me many times, even discusses with dear husband who does not yell. He is full blood Norwegian and a very quiet man. I grew up with an Italian father, a not so quiet man. He shouted when he was happy or mad. Shouting works for me at times. I am willing to accept that, for as little as I do it. I also would like to seek out a better way because I think a new awareness came upon me and that is that shouting may not work with older children. (I did not shout at my babies or toddlers). I don’t think this is a huge problem in my family, but I would like to be better prepared for the older years. I’m not a real yeller, have to say it occurs infrequently around here, but I do react way too often, impatiently and with frustration. It can be yelling-“light” at times, certainly lots of annoyed reactions that accumulate and occasionally lead to yelling–at least for me! I hope to follow this thread to help shed some light on these behaviors. Ultimately the goal is the same–more fun, more joy. Thank you Carrie!! Thank you for this new series–it goes straight to the heart and is good medicine. I loved your encouragement to remember the times we are marvelous! I have my children with me 24 hours a day. So often I feel like the day was a failure because of a couple minutes out of the day when I yelled at my child, or was short tempered with them and completely discount the hours of wonderful moments we had! Thank you for this post, I’m looking forward to the rest of the series!